It's been a time of transition for Tim Baker. 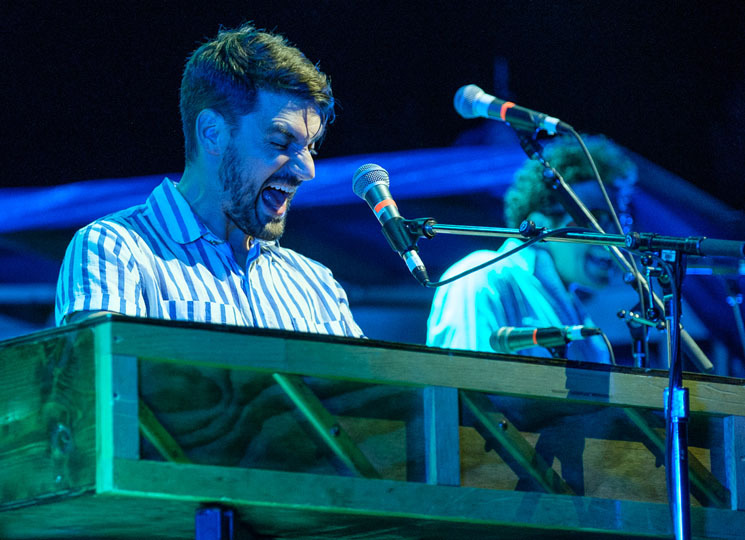 The singer-songwriter, best known as lead singer of beloved St. John's folk-popsters Hey Rosetta!, moved to Toronto a year-and-a-half ago as his old outfit was calling it quits, and returned to Hillside with a new band and fresh material in tow. Playing songs from an upcoming solo album, Baker quickly introduced a keyboard-led jaunt that resembled new Father John Misty and older Bahamas, pairing pop sprightliness with a troubadour's weariness. Baker, now 35, painted pictures of ex-girlfriend's weddings and hometown longing with a newfound lyrical maturity. Sure, Hey Rosetta! 's horn- and string-bolstered palette added orchestral richness to their emotive tracks, but Baker's new band and material stripped things down to expose a rawer, more emotional core. It was easiest to see how far he'd come when he busted out some Hey Rosetta! covers, sprinkled wisely (and sparingly) throughout the set to court the many diehards who packed the front of the crowd. Hey Rosetta! standouts "Harriet" and "Welcome" were given toned-down renditions to match the horn- and string-less lineup, but it showcased the strength of Baker's subdued new arrangements by slowly drawing the audience in before exploding into a raucous climax instead of his old outfit's penchant for kicking things off from the start and keeping it in high gear throughout. Hey Rosetta! 's method worked throughout their acclaimed career, but Baker's newfound restraint befit his new solo act — even if he wasn't the only player on stage, he was surely the focal point. Look no further than the encore rendition of Hey Rosetta! 's "Bandages," which found Baker alone with an acoustic guitar before the rest of the band quietly piled on for an explosive finale. Baker is still the same emotive songwriter that made Hey Rosetta! such a force in Canadian music, but his new solo material shows a welcome evolution from his earlier work.